By Krista Baliko Posted: January 16, 2019 2:00 p.m.
A partnership between University of Regina researchers and Indigenous Works, a national not-for-profit organization, recently received federal funding to strengthen the research capacity of Indigenous organizations. The aim is to assist with addressing the issue of Indigenous exclusion in the wider Canadian economy. “Indigenous inclusion in the economy needs to be part of reconciliation efforts across the country,” says Dr. Peter Moroz, associate professor of entrepreneurship at the University of Regina. Kelly Lendsay, Indigenous Works president and chief executive officer, has numbers that back this up. Lendsay says the engagement gap points to a glaring need. “In the spirit of reconciliation, we want to find out how to mobilize Indigenous and non-Indigenous people with new engagement strategies that help them build effective and authentic partnerships between mainstream and Indigenous communities, leading to increased employment opportunities, enterprise and procurement developments, and social investments – ultimately building healthier and stronger communities,” says Lendsay. Funding for this collaborative project was announced on Monday by the Honourable Kirsty Duncan, Minister of Science and Sport. 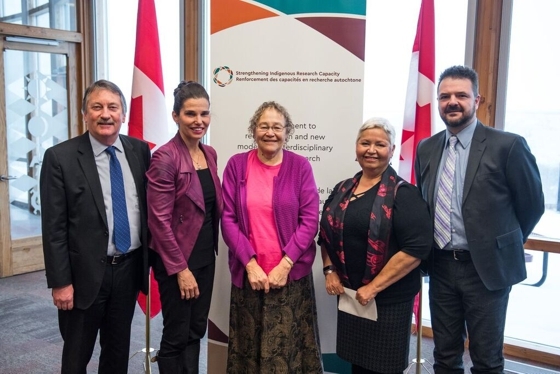 The support comes from the Social Sciences and Humanities Research Council (SSHRC) through their inaugural Indigenous Research Capacity and Reconciliation Connection Grants. “First Nations, Métis, and Inuit in Canada have been kept on the sidelines of Canadian research too long. That’s why we are working to ensure that Canada’s research funding and policies benefit everyone, including Indigenous peoples as full participants. Our government understands the value of Indigenous research and respects all the dimensions of knowledge about the connections between people, places, and the natural environment," says Duncan. Ted Hewitt, chair of the research coordinating committee and SSHRC president, also attended this week’s funding announcement. “We were extremely pleased to see incredible interest in this new initiative as demonstrated through the high quantity and quality of grant proposals from Indigenous organizations and researchers. The federal granting agencies are proud to be at the forefront of the mission to grow the capacity of Indigenous communities to conduct research and partner with the broader research enterprise,” says Hewitt. Moroz says this funding will allow University researchers to help strengthen the research capacity of Indigenous organizations so the organizations can address the disconnect in the market themselves. Lendsay is excited about the many areas they are delving into, especially one that has the potential to create new engagement and partnership opportunities that can accelerate employment, enterprise, and social development. University of Regina researchers are providing the groundwork and capacity. “We’re working for and supporting Indigenous Works, who are doing cutting-edge work,” says Moroz. Dr. David Malloy, vice-president (research) at the University of Regina, says the project is helping to foster meaningful change on the business landscape of the nation. “Our scholars, with our community partners, are aiming high because we are committed to our communities, to research that has impact, and to Indigenization, helping us all move forward in advancing reconciliation,” says Malloy. Find out more about the Indigenous Research Capacity and Reconciliation Connection Grants.